Dhruv Vikram’s ‘Adithya Varma’ is the official remake of the Tollywood blockbuster ‘Arjun Reddy’. The movie went on floors recently, with many cast members joining, and here’s a new update from the team. The team is currently shooting for the movie in Lisbon, Portugal. 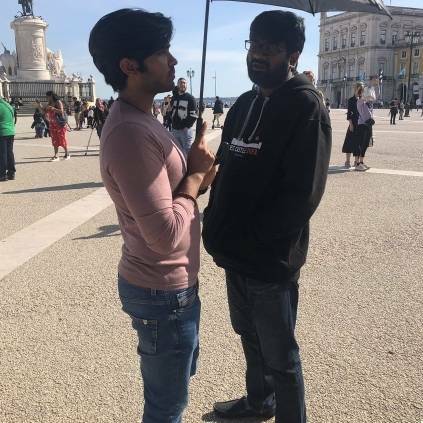 Looks like the team is filming the foreign portions that were seen in ‘Arjun Reddy’ where Vijay Devarakonda sported a long hairdo. ‘Adithya Varma’ stars Dhruv Vikram and Banita Sandhu in lead roles, along with Priya Anand and Anbu Thasan playing crucial roles. It is directed by Gireesayya and has music by Radhan. Ravi K Chandran is handling the camera. The project is bankrolled by E4 Entertainment. People looking for online information on Adithya Varma, Arjun Reddy Tamil remake, Banita Sandhu, Dhruv Vikram, Priya Anand will find this news story useful.